The Modern Woodmen of America (MWA) fraternal life insurance company of Rock Island has an uncommon longevity. It has been in business since 1883, and has been an anchor in downtown Rock Island for over 110 years. Always it has occupied a building of outstanding architectural merit. The first MWA home in Rock Island, at the corner of 15th Street and Third Avenue, was dedicated in 1897 and occupied in 1899. The company prospered there, growing so well that an addition equal in size to the original was needed. By the 1960s, even more space was needed, so MWA decided to construct a brand new building on the Rock Island riverfront, as shown on today’s postcard. It was designed by the prominent architectural firm of Graham, Anderson, Probst, and White (GAPW), with local architect William Stuhr as an associate. GAPW is the oldest, continuously practicing, architectural firm in Chicago. It was founded in 1873 by Daniel Burnham and John Wellborn Root. They were known for designing such landmarks as Chicago’s fortress-like Monadnock Building and the more delicate appearing Rookery. Burnham is famed for his plan for Chicago in the early 1900s, as well as his oft-quoted statement, “Make no little plans. They have no magic to stir men’s blood…..” In 1917, the firm evolved into Graham, Anderson, Probst, and White. Working in a style they called Commercial Classicism, the group gave us such well known Chicago buildings as the Wrigley Building, the Shedd Aquarium and the Merchandise Mart. 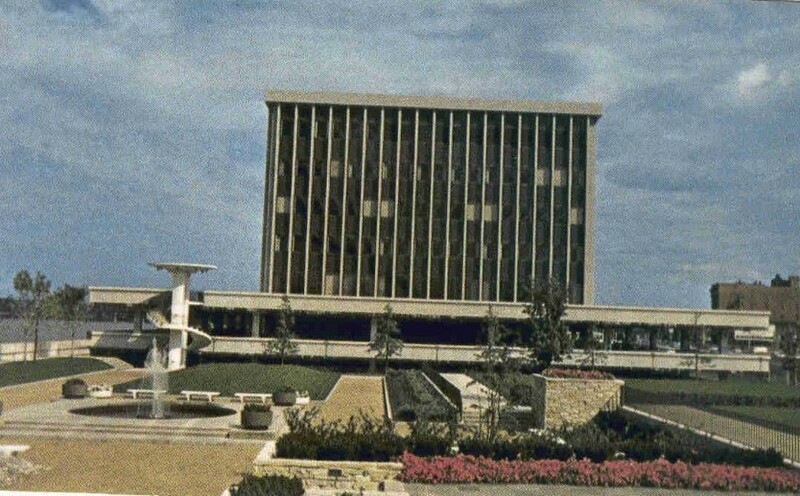 Rock Island became the site of the latest GAPW design when ground was broken for the postcard building on April 1, 1965. Covering 5 acres of Mississippi riverfront property with an 1100 foot frontage, the new MWA home office is supported by 86 caissons sunk deep into bedrock. Massive pumps, which have been put to the test over the years, ensure that the building remains untouched by floods. The 5-story, 108 x 252 foot office tower sits above a two-story 202 x 364 foot parking garage, whose roof forms a large open plaza that abuts the river. Although the building is supported by structural steel and reinforced concrete, the exterior surface was designed with bronze-anodized aluminum panels and solar-reflecting bronze-toned glass, separated by 124 massive protruding vertical “fins” of Carolina mahogany granite. The interior features Italian travertine marble in the lobbies and several other areas. This new home of MWA was dedicated on September 19, 1967. After moving there, the old building on Third Avenue was sold to Rock Island County for use as office space. The postcard shows the west, narrower side of the new building. The vertical granite elements contrast with the strongly horizontal parking and plaza base. At the left, near the river, there is a cantilevered spiral staircase supported by a stark white column that adds a delicate touch to this massive structure. In the foreground are elegant Japanese-influenced gardens, with raked sand beds and restrained shrubbery. In 1995, further expansion of the home office required much of the garden to be covered with a second building. Architectural firm Flad & Associates of Madison, Wisconsin, designed the new, 90,000 square foot office building in materials — granite, insulated glass, and bronze-anodized aluminum — to complement the older building. The newer building contains two levels for parking and three for office use. Several years later, Flad & Associates directed an $18 million, three-year renovation of the postcard building. This renovation, completed in 2004, included new climate control systems, replacement of single pane windows with insulated glass, and new lighting. New carpeting, wall coverings, and furnishings were also part of the project with the overall goal of making the building both energy and space efficient. Although the new mechanical systems required increasing the size of the rooftop penthouse, it is still recessed so that it is not a prominent visual feature. The Modern Woodmen of America home office building can be counted among Rock Island’s architectural gems of our recent past. This article by Diane Oestreich, slightly modified, originally appeared in the Moline Dispatch and Rock Island Argus on February 3, 2008.